Male and female participants in Saturday's race will be competing for the BVI Tourist Board top prize of $1,000. Here, BVI Tourist Board Director Sharon Flax-Mars, right, and events coordinator Cindy Rosan-Jones, presents a check to BVI Athletics Association president Dean "The Sportsman" Greenaway. With 117 persons pre registered so far for Saturday's 10th annual Deloite-Ogier BVI Sunrise Half Marathon presented by the BVI Tourist Board and the BVI Athletics Association, this year's edition will see the fastest race in the last five years. Final registration is scheduled for 5-7 p.m. at the Multipurpose Sports Complex on Friday. On Saturday, the race begins at 6 a.m. on the A. O. Shirley Grounds and will also finish there, after traversing to Port Purcell, down to Pockwood Pond and return for a total of 13.1 miles. 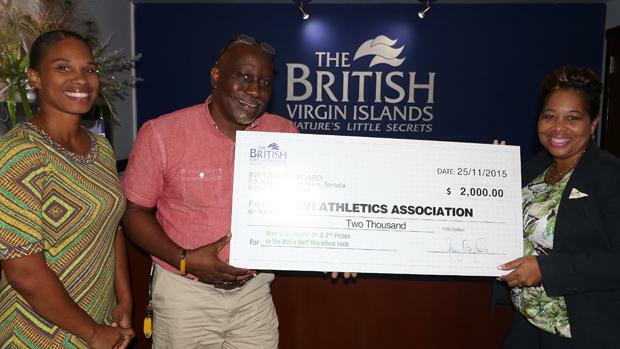 The race is the first event of the BVI Athletics Association's 45th anniversary activities that continues with association's 7th Awards Gala on Dec 29. Events run through July with the hosting of the OECS Track and Field Championships. For the last three years, St. Thomas' Shane DeGannes has dominated the event. This year DeGannes will have a bevy of challengers led by St. Vincent and the Grenadines' Pamenos Ballentyne. Ballentyne was third in the fastest race run here during the 5th edition run in conjunction with the OECS Half Marathon in 2010, when he ran 1:09.50, as the course record of 1 hour 07 minutes and 38 seconds was established. Ballentyne, DeGannes, Reuben Stoby and Vincent Fouriner are expected to be the leading protagonists seeking to bag the $1000 top prize, offered by the BVI Tourist Board. Another $500 is on offer if they dare eclipse the 1:07.38 mark, while the top woman will also bag $1000 and could take home another $250 for getting under the 1:34.09 course record. The top five men and women will also win cash as well as the first runner over 45 years of age and the oldest finisher. "I'm looking to win the BVI Sunrise Half Marathon, that's my main goal," Ballentyne said. "I'm training for the Trinidad and Tobago Marathon on January 17, so BVI is really part of my preparation program. My main goal is to win and run a good time." He's coming off a second place finish in the NACAC 10K on home soil behind a Kenyan. "It was a good race," he noted. "St. Vincent has a lot of hills. Right now I'm running good, not in my best shape, but I'm in enough shape to win the BVI Sunrise Half Marathon." DeGannes who tuned up for his title defense at the Foot Locker Nationals in North Carolina on Saturday with a second place finish in the 5K in 16:19, said he has been preparing for the BVI race. Stoby who has dominated the local scene said he has been putting in the work. "I expect the competition to be stiff," he said. "I'm aiming for around an hour and 20 minutes. First time I did it, I did 1:35. I think I've improved tremendously over the last couple of years and have put in a lot of hard work without a doubt and I feel confident I can run a fast time." Fourier is looking to get under 1:25. "1:20, that's fast," he said of Stoby's goal. "But, every race we do, we do our best and we'll see what happens." BVI's Katrina Crumpler will seek to defend her run against St. Thomas' Ruth Ann David, who has won the event two successive year's before Crumpler and came within 10 seconds of the 1:34.09 fastest women's time. Then there's Rosmond Johnson and Melissa Brunner among others who will be seeking to place in the top five finishers, as the women too will have their battle on the road. Race founder Simon Cook said its great that the event is still going and getting stronger each year. "There are so many people out running during the week now with all different abilities which is great and people are enjoying it," noted Cook. "Kay (Reddy) and the team have done a super job building it up. I didn't envision it would carry on like this. It's great that these other running races are going on as well. The 10K's, 5K's, 2 Miles and the Tortola Torture, long may it continue and I think it will. A lot of people are doing running races and Marathons."